I just ordered Right Start Level E and the Fractions level. 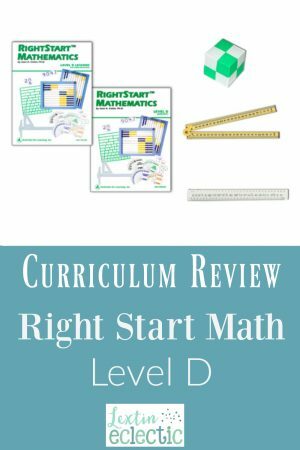 We are almost done with Right Start Math for Curly. After she completes Level E and Fractions she will only have the Geometry level left. I’m so sad to be at the end of the Right Start programs for Curly. This is my favorite, favorite math program. After every 5 lessons there are 2 review worksheet pages. Here’s a recap of lesson 100. The warm up section contains the multiplication problem of 4098 x 54. Next you ask the child questions such as: “10 times what is 20? 10 times what is 80? 10 times what is 100?” and so on. At the beginning of the lesson, the fact page is listed with all the answers. We did not do these during the lesson time but I assigned them as independent work. First I got out the colored tiles and put out 18 of them in front of Curly. I asked her how we could divide them between 3 people equally and how many each person would get if we did so. She took the tiles and portioned them out between 3 piles until she discovered the answer. Then we drew a part-whole circle on the whiteboard and she helped me complete it using the numbers from our previous problem. We then wrote the problem as both a multiplication and division equation. Next we did another problem together: 28 tiles divided among 4 people. I gave her the tiles and had her determine the answer. Then she drew her own part-whole circle and wrote the equations on the whiteboard. The last problem that we worked together involved dividing 2 pizzas cut into 8ths between 4 people. I had Curly draw a part-whole circle to help her determine the answer. At the end of the lesson, I assigned the worksheet page for independent work. This page had 4 similar word problems which Curly used division to solve. Each lesson begins with a short warm up section that is a review. It includes multi-digit addition or subtraction, or in later lessons, multi-digit multiplication practice. Many of the lessons also had a short fact page worksheet that had practice problems for multiplication facts. The lessons introduce topics incrementally, such as teaching skip counting and having a child recognize the patterns in the skip counting before progressing to more difficult multiplication with those numbers. The program uses manipulatives, an abacus, and teaching aids such as part-whole circles to demonstrate the concepts. The teacher’s manual is easy to follow and often contains pictures and illustrations to walk the teacher through using the manipulatives or demonstrating the lessons. Most lessons also contained a worksheet which I had Curly complete independently. Therefore, this level is less teacher-intensive than some of the previous levels. We’re a little hung up in level D. My son has progressed well through the program, but has always been SLOW on math facts, so we’re taking a beak to focus on building his speed. Have you been able to feel out when the 3- seconds per question level of mastery is expected for their math facts? We have just kept going because accuracy was good, but we’re now at a point where the slowness is real blogging down his ability to progress (ex: a set of 50 multiplication facts will take at least 30 minutes! ). What have you done to build up speed? We are struggling with this as well. I’ve been trying apps, flashcards, and fact worksheets. My kids are still slow in recalling the math facts. Thanks. We’ve recently started doing Xtra Math (free online) daily and I am seeing improvement in speed. I think I will just keep this going along with our lessons and games and de-emphasize the fact worksheets until we’ve mastered them (+-x/) in Xtra Math. I think for my boys separating the writing of numbers from the timing of their math facts is very helpful. The fine motor skills are half of the slowness, so we can work on those skills separately.